Sometimes the users while connecting to a modem experience that the Laptop only sees 2.4 GHz and Not 5 GHz. In this case first of all they should check whether their laptop supports 5 GHz or Not or it Supports 2.4 GHz Only. Here is a simple solution to Find out this on your Laptop. 1. Search CMD in Windows 10 Search Box. 2. Now, Click on Command Prompt icon to Open Command Prompt. 3. Now, Write the Following Command Given Below. 4. Hit Enter Key to Execute the Command. 5. Locate Radio types supported line. If Radio types supported line shows 802.11g and 802.11n network modes, Your Laptop has 2.4 GHz network capability only. 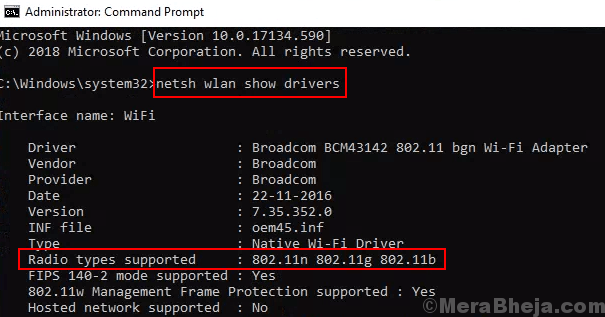 If Radio types supported line shows 802.11n, 802.11g and 802.11b network modes, Your Laptop has 2.4 GHz network capability only. But, If Radio types supported line shows 802.11a and 802.11g and 802.11n network modes, Your Laptop has 2.4 GHz and 5GHz network capability only. Which means your Laptop supports 5GHz network .